The FortiGate/FortiWiFi-80C series of wireless network security platform deliver complete security for branch offices, service provider customer premise equipment (CPE), retail networks, and mobile point-of-sale applications. They provide integrated compressive network security at hardware-accelerated speeds, ensuring that your application and network security does not act like a bottleneck and slow availability or performance. 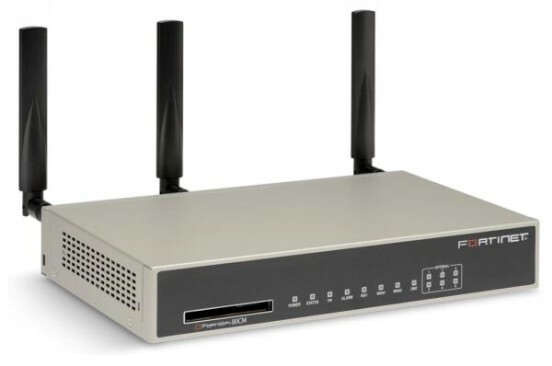 The FortiGate/FortiWiFi-80 Series platforms offer dual WAN Gigabit Ethernet (10/100/1000) links, for load balancing or redundant ISP connections delivering high availability and scalability to small or home office application. Six Fast Ethernet (10/100) internal security zone or switch ports and one dedicated DMZ port eliminate need for additional networking devices, reducing investment and management burden. An ExpressCard slot allows for optional 3G wireless WAN connectivity such as EVDO, W-CDMA, HSPA and GPRS, which provides mobile network connectivity for remote deployments or backup data connectivity in the event of a network failure. The FortiGate/FortiWiFi-80CM platforms gives you the additional convenience and reliability of an analog modem. The internal storage standard on the FortiGate/FortiWiFi-80 Series enables local caching of data for policy compliance or WAN optimization. WAN optimization lowers your networking costs and improves your application and network performance by reducing the amount of data transmitted over your WAN. Taking advantage of the new FortiOS operating system, the FG-80C/CM boasts data SSL-encrypted traffic inspection, leakage prevention, identity-based policies, IPS enhancements, and application control to offer protection against Web 2.0 threats and evasive applications and users. Deployment flexibility is enhanced with the ExpressCard slot supporting 3G WAN connectivity options. Rapid, turn-key deployment and easy management deliver low total cost of ownership and easily facilitate compliance with important legislative requirements such as PCI and Sarbanes-Oxley. Fortinet's market-leading security technology and research results in appliances providing unmatched protection against today's sophisticated multi-vector threats. FortiGate/FortiWiFi consolidated security platforms integrate firewall, IPSec and SSL VPN, antivirus, antispam, intrusion prevention, web filtering and vulnerability management into a single device at a single price. They also provide data loss prevention (DLP), application control, and endpoint NAC. The FortiGate/FortiWiFi-80 Series specifically addresses many policy enforcement requirements included in government and industry regulations, such as the PCI Data Security Standard. They also ease migration to new industry standards such as IPv6, supporting dynamic routing or both IPv4 and IPv6 networks. Fortinet's Global Threat Research Team and ICSA Labs-certified inspection engines ensure the best possible protection in your network. The FortiGate product family provides cost-effective, comprehensive protection against network, content, and application-level threats. It defends your environment from complex, sophisticated attacks without degrading network availability and affecting application performance. FortiGate platforms combine the purpose-built FortiOS™ security operating system with custom FortiASIC processors and other hardware to provide a comprehensive and highperformance array of security and networking functions. The FortiGate product family delivers the highest level of network, content, and application security for enterprises of all sizes, while reducing total cost of ownership. With Fortinet, you deploy the network security you need to protect your intellectual property, preserve the privacy of critical customer information, and maintain regulatory compliance. FortiASIC is the foundation of Fortinet’s unique hardware technology. FortiASIC is a family of purpose built, high-performance network and content processors that uses an intelligent proprietary content scanning engine and multiple algorithms to accelerate computeintensive security services. FortiASIC provides the performance required to deliver enterprise and carrier-class UTM services. Coupled with the FortiOS security hardened Operating System, FortiASIC delivers extreme performance and security. FortiOS 5.0, the world's most powerful security operating system, is the foundation for all Fortinet FortiGate integrated security platforms. It provides more security, intelligence and control to help enterprises be better protected against today's advanced threats and enable more secure BYOD environments. More Security to fight advanced threats. A client reputation feature gives enterprises a cumulative security ranking of each device based on a range of behaviors and provides specific, actionable information that enables organizations to identity compromised systems and potential zero-day attacks in real time. The new advanced anti-malware detection system adds an on-device behavior-based heuristic engine and cloud-based AV services that includes an operating system sandbox and botnet IP reputation database. Together with superior industry-validated AV signatures, FortiOS 5.0 delivers unbeatable multi-layered protection against today's sophisticated malware. More Control to secure mobile devices and BYOD environments by identifying devices and applying specific access policies as well as ecurity profiles, according to the device type or device group, location and usage. More Intelligence with automatic adjustment of role-based policies for users and guests based on location, data and application profile. Enhanced reporting and analysis also provides administrators with more intelligence on the behavior of their network, users, devices, applications and threats. Fortinet firewall technology delivers industry-leading performance for network and application firewalling including Web 2.0 application policies based on the application identity, up to and beyond 10 Gbps throughput. Our technology identifies traffic patterns and links them to the use of specific applications, such as instant messaging and peer-to-peer applications, permitting application access control. By coupling application intelligence with firewall technology, the FortiGate platform is able to deliver realtime security with integrated application content level inspection, thereby simplifying security deployments. Antivirus content inspection technology provides protection against virus, spyware, worms, phishing and other forms of malware being transmitted over the network infrastructure. By intercepting application content in transit, and reassembling the data into user expected content, the FortiGate Antivirus features ensures that malicious threats hidden within legitimate application content is identified and removed from the data stream destined for internal (or external) recipients. The addition of Fortinet's FortiGuard subscription services ensured each FortiGate has access to updated malware signatures, resulting in high level of accuracy and detection capabilities including emerging and newly discovered viruses. ICSA Labs has certified our antivirus functionality. Fortinet VPN technology provides secure communications between multiple networks and hosts, through both secure socket layer, or SSL, and IPsec VPN technologies, leveraging our custom FortiASIC to provide hardware acceleration for high-performance communications and data privacy. Benefits include the ability to enforce complete content inspection and multi-threat security as part of VPN communications, including antivirus, Intrusion Prevention System, or IPS, and Web filtering. Additional features include traffic optimization providing prioritization for traffic across VPNs. IPS technology provides protection against current and emerging network level threats. In addition to signature-based detection, we perform anomaly-based detection whereby our system alerts users to traffic that fits a profile matching attack behavior. This behavior is then analyzed by our threat research team to identify threats as they emerge and generate new signatures that will be incorporated into our FortiGuard services. With WAN Optimization, you can accelerate applications over your wide area links while ensuring multi-threat security enforcement. FortiOS 4.0 software not only eliminates unnecessary and malicious traffic as one of its core capabilities, it also optimizes legitimate traffic by reducing the amount of communication and data transmitted between applications and servers across the WAN. This results in improved performance of applications and network services, as well as helping to avoid additional higher-bandwidth provisioning requirements. SSL-Encrypted Traffic Inspection protects clients and web and application servers from malicious SSL-encrypted traffic, to which most security devices are often blind. SSL Inspection intercepts encrypted traffic and inspects it for threats, prior to routing it to its final destination. SSL Inspection applies to both client-oriented SSL traffic (such as users connecting to an SSL-encrypted hosted CRM site) and inbound traffic destined an organization's own web and application servers. You now have the ability to enforce appropriate use policies on inappropriate encrypted web content, and protect servers from. Endpoint NAC enforces the use of the FortiClient Endpoint Security application (either Standard or Premium editions) on your network. It verifies the installation of the most recent version of the FortiClient application, up-to-date antivirus signatures, and enabled firewall before allowing the traffic from that endpoint to pass through the FortiGate platform. You also have the option to quarantine endpoints running applications that violate policies and require remediation. It is imperative for you to control the vast amount of confidential, regulated, and proprietary data traversing your network, and keep it within defined network boundaries. Working across multiple applications (including those encrypting their communications), DLP uses a sophisticated pattern-matching engine to identify and then prevent the communication of sensitive information outside the network perimeter. In addition to protecting your organization's critical information, DLP also provides audit trails for data and files to aid in policy compliance. You can use the wide range of configurable actions to log, block, and archive data, as well as ban or quarantine users. Web filtering technology is a pro-active defense feature that identifies known locations of malware and blocks access to these malicious sources. In addition the technology enables administrators to enforce policies based on website content categories ensuring users are not accessing content that is inappropriate for their work environment. The technology restricts access to denied categories based on the policy by comparing each Web address request to a Fortinet hosted database. FortiGate consolidated security appliances provide extensive logging capabilities for traffic, system, and network protection functions. They also allow you to assemble drill-down and graphical reports from detailed log information. Reports can provide historical and current analysis of network activity to aid with identification of security issues and to prevent network misuse and abuse. Virtual Domain (VDOM) enable a single FortiGate system to function as multiple independent virtual FortiGate systems. Each VDOM contains its own virtual interfaces, security profiles, routing table, administration and many other features. FortiGate VDOMs reduces the complexity in physical network by virtualizing different security resources over a common platform, greatly reduces the power and footprint required by multiple point solutions. High Availability (HA) configuration enhances reliability and increases performance by clustering multiple FortiGate appliances into a single entity. FortiGate High Availability supports Active-Active and Active-Passive options to provide the maximum flexibility for utilizing each member within the HA cluster. HA feature is included as part of the FortiOS operation system so end-users can benefit from the reliability enhancement without the extra cost. Application control enables you to define and enforce policies for thousands of applications running on your endpoints, regardless of the port or the protocol used for communication. Application classification and control is essential to manage the explosion of new web-based applications bombarding networks today, as most application traffic looks like normal web traffic to traditional firewalls. Fortinet's application control technology identifies application traffic and then applies security policies easily defined by the administrator. The end result is more flexible and granular policy control, with deeper visibility into your network traffic. Wireless controller integrated into every FortiGate platform centralizes the management and monitoring of all FortiAP units. All wireless traffic is directed to the FortiGate multi-threat security platform and undergoes identity-aware firewall policies and UTM engine inspection and only authorized wireless traffic is forwarded. From a single console you can control network access, update policies quickly and easily, and monitor compliance. All performance values are "up to" and vary depending on system configuration. Antivirus performance is measured using 44 Kbyte HTTP files. IPS performance is measured using 1 Mbyte HTTP files. FortiGuard® Security Subscription Services deliver dynamic, automated updates for Fortinet products. The Fortinet Global Security Research Team creates these updates to ensure up-to-date protection against sophisticated threats. Subscriptions include antivirus, intrusion prevention, web filtering, antispam, vulnerability and compliance management, application control, and database security services. 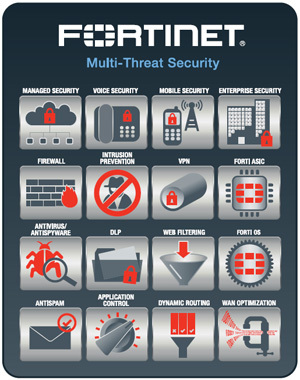 FortiCare™ Support Services provide global support for all Fortinet products and services. 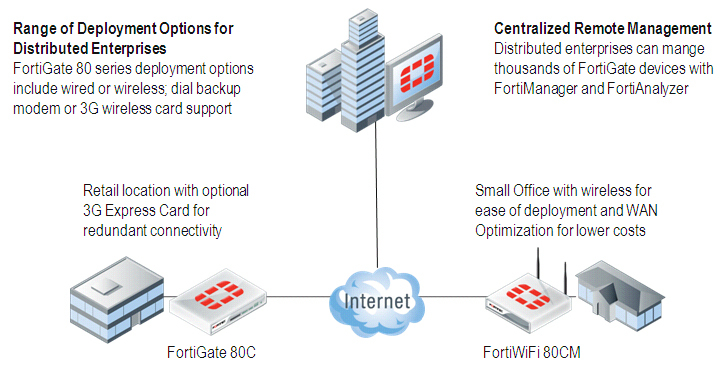 FortiCare support enables your Fortinet products to perform optimally. Support plans start with 8x5 Enhanced Support with return and replace hardware support or 24x7 Comprehensive Support with advanced hardware replacement. Options include Premium Support, Premium RMA, and Professional Services. All hardware products include a 1-year limited hardware warranty and a 90-day limited software warranty. Download the Fortinet FortiGate 80C/CM and FortiWiFi 80CM Datasheet (PDF).